MY car thermometer read 6.5°C as I set off to the Berkshire, Buckinghamshire and Oxfordshire Cross Country Championships. It was going to be a chilly one. The venue was to be Newbury Showground, which, from my experience as a Berkshire Schools XC Championships spectator over the past few years, I knew to be pancake flat. Oh yes, apart from that hill they added in just for the day! 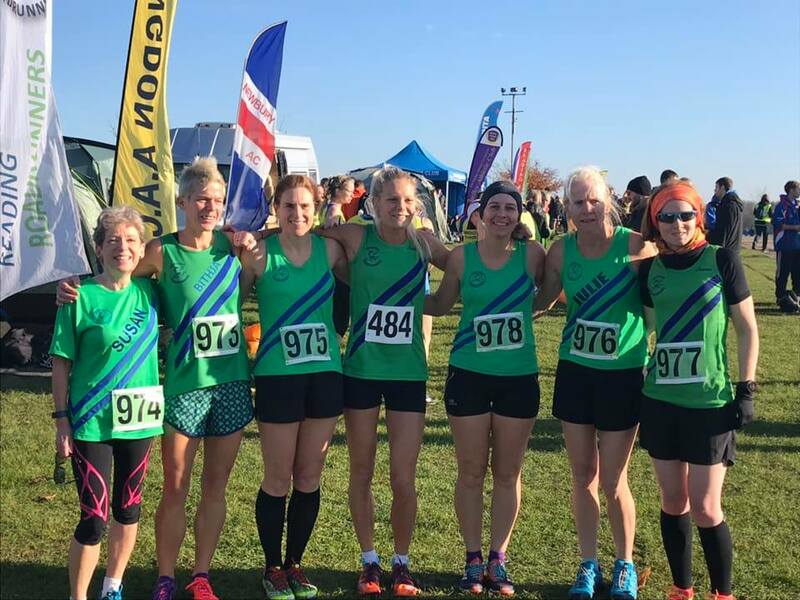 We needed a team of eight women for this fixture, and with only six interested parties a couple of days before the entries were due, I was prepared to put myself in the team, despite having little confidence in my post-injury ability. Julie Rainbow stepped forward (yes! ), and I was even more delighted to strike a deal with Bithja Jones (right); I would look after Bithja’s children while she ran. This made much more sense for the team. We only had one senior woman in our team, and it was only one we needed. 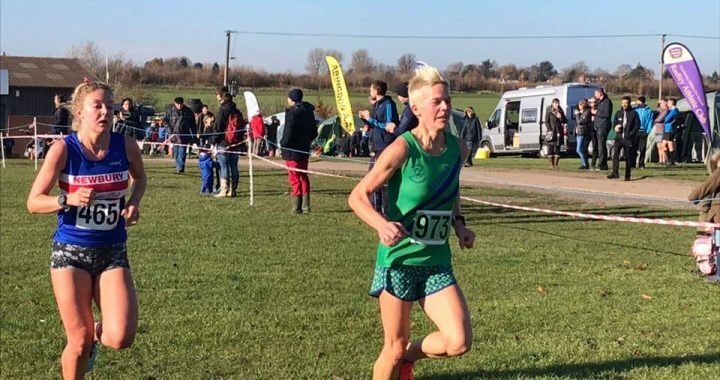 Chantal Percival, this time well aware of the 6k course distance (unlike at Datchet last weekend, where the 6k she expected was actually six miles) was right up with the elites on lap one, and only slipped back slightly by the finish. 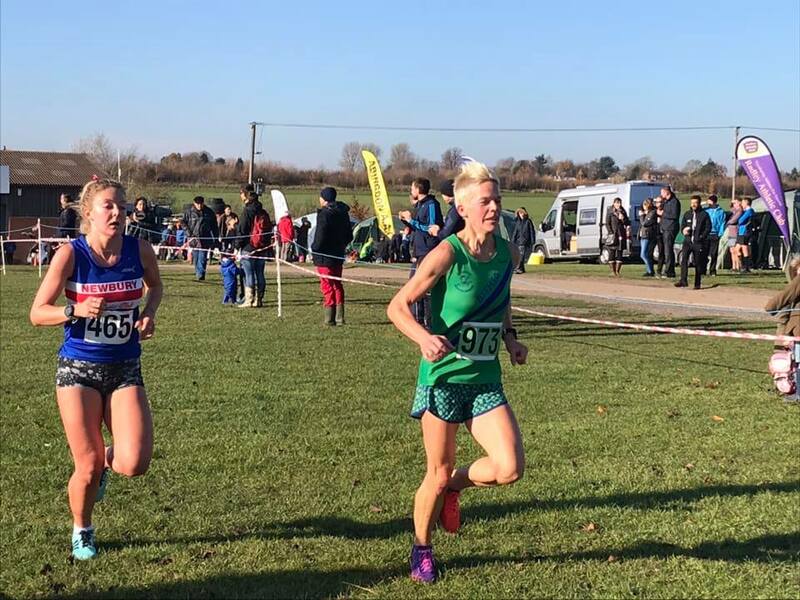 Nevertheless, she still maintained an excellent third place overall, behind Anna Boniface of Reading AC and Jess Franklin of Newbury AC. With Jess being an FV35, and with the strange way the prizes work at the BBO, this meant that Chantal was also given the prize for second senior woman. An excellent haul! With no chance of a senior team prize (that went to Reading AC), our hopes were pinned on the vets, as we had managed third place last year. First of our vet ladies was Bithja Jones (see, I knew it was best that I watched the children! ), with Helen Pool and Julie Rainbow our second and third scorers. 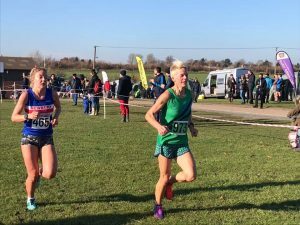 Next in was Nicole Rickett, followed by Lesley Whiley, Susan Knight and Claire Seymour, with the latter having tried to distract herself from any running pain with thoughts of her sister, who was in labour at that time. All had enjoyed their runs, despite reports of a strong wind all around the course, and an extra 0.5k that shouldn’t have been there. I noticed that this extra 0.5k had disappeared from the under 17 men’s and women’s 6k race later in the day, when my daughters were running. The prizegiving seemed to take a long time to arrive. As well as Chantal’s medals, we were really chuffed for Bithja, who collected the prize for second vet, and even more chuffed to pick up the shield for first vet team. Or we would have been, had the shield been returned by Reading AC in time for the competition! The team scorers will have to be content with the tiniest medals in the world in the meantime. Oh yes, and they will need to provide their own ribbons too. I am so proud of what the women’s team achieved today – well done to everyone who ran, and thank you for turning out for the team. 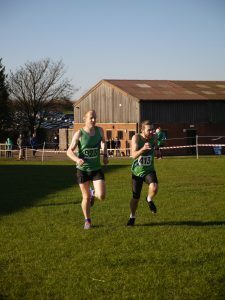 Fielding a team of 12 men during a busy racing year is always going to be a challenge, although last year it seemed slightly less so, with the fixture being local in Prospect Park. Next year it is our turn to host, so let’s see what happens then. Six seniors were needed to score as a team, so with only three entered, it was left to the individuals to decide whether to run or not. David McCoy decided he would like nothing more than running 10k before his impending night shift, and we were pleased to have him on board. Lap one, and DMC was first RR. Lap two, the same. But bring on the finish, and it was Lance Nortcliff who rounded the corner first, with David on his shoulder (left). They tell me the race that ensued was planned, just to give me something to write about. Whatever, it was entertaining, with David just clinching the ‘win’ as Lance cheered him on. Another two vets were needed to score, and it was Andrew Smith and Andy Blenkinsop who did the honours, having changed places during the final lap. Following them in were Pete Jewell, David Caswell, Alan Williamson, Peter Reilly, and, having fallen foul of misbehaving shoelaces, Chris Manton. The senior prizes were picked up by a whole load of youngsters, so our hopes were again with the vets, with the vet men having won the shield for first team last year. It is a strange phenomenon of the BBO and Berkshire championship races that a veteran man can be 35 or over, rather than 40, and so, with all of our vets over 40, we felt somewhat hard done by. Nevertheless, Lance picked up the medal for third vet, and the team was also able to claim third place – excellent! Newbury AC, on the other hand, cleaned up with both the senior and vet men’s trophies. Well done to all of the men who contributed to the team today; it is much appreciated. * Pictures: Peter Reilly and Bithja Jones. Our team pictures shows (from left): Susan Knight, Bithja Jones, Helen Pool, Chantal Percival, Claire Seymour, Julie Rainbow and Nicole Rickett.